A few days into Vikings training camp last weekend their esteemed offensive coordinator was unsure how to pronounce a certain player’s name, but he sure knew who he was. Norv Turner needed an assist from the throng of media members gathered inside the interview tent to pronounce Matt Asiata’s last name, but needed no help singing his praises. The accolades were unprompted and bordered on effusive. 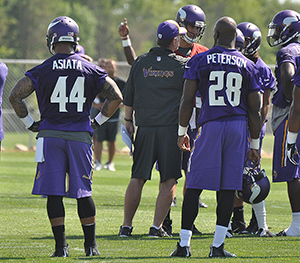 The head coach echoed those sentiments a few days later when asked about Asiata. In other words, if there were any lingering doubts regarding the answer to the question, “Who’s replacing Toby Gerhart as the backup to Adrian?” I think we have our answer. Closed circuit to fantasy owners in larger leagues looking to insure their No. 1 overall pick of Adrian Peterson: Asiata is the guy. There has been a lot of hopeful gushing about rookie running back Jerick McKinnon. He’s certainly flashed the skills in Mankato that made him a combine legend and too tough for Rick Speilman to resist taking a shot at in the third round, but he’s definitely behind Asiata on the depth chart right now. An undrafted free agent who signed with the Vikings out of Utah in 2011, Asiata toiled in relative obscurity behind Peterson and Gerhart for three years. That is, until last winter when the injury bug slammed the Vikings backfield, sidelining both Peterson and Gerhart. If you’ll recall, Asiata made his first career start last Dec. 15 and took a whopping 30 carries in their 48-30 shellacking of the Eagles. He only gained 51 yards, but he tied a team record with three rushing touchdowns. Two weeks later he rumbled for 115 yards on 14 carries against the Lions. Not bad for a guy who was accustomed to only getting his uniform dirty on special teams. The last several seasons, it was Gerhart who would routinely fill in when Peterson required a few plays off here or a series off there. It was Gerhart who would be called upon to start when Peterson got hurt. However, Gerhart’s agent did him a huge favor and netted him a nice deal in free agency with the Jacksonville Jaguars, a team in need of a running back thanks to the departure of Maurice Jones-Drew. Free from backing up the best running back on the planet, Gerhart finds himself in line to get about 15 touches a game in 2014. Good for him. He’s a good kid. We wish him well. As for Asiata, the hope for Vikings fans is that they won’t need to see too much of him this season because that would indicate something bad happened to their franchise player. When called upon, though, you can expect him to be in the right place, know his assignment, pass-block well, catch a pass if need be, and get you three yards and a cloud of dust. He’s not flashy like the rookie McKinnon, but he’ll get the job done in all facets. The first thing coach Zimmer says about him is he’s dependable. McKinnon on the other hand will probably flash some this preseason. He’ll make a play or two that gets the fans on their feet and clamoring for more. However, he’s new to the running back position. He’s still learning the ropes. McKinnon probably isn’t the guy you want in there pass blocking right now. I’m guessing coach Turner will reach into his bag of tricks and draw up some nifty packages for the young man as a rookie, but if you’re hoping he’s the next Darren Sproles right away you might be disappointed. At least early on. Remember last season when the previous regime brought along Cordarrelle Patterson at a frustratingly slow pace? It’s a different coaching staff this season, but fans might experience similar frustration as they pine for McKinnon. If that happens, it’s probably a good sign. It will mean Peterson is being Peterson and also catching more passes than ever. And it will mean Asiata is successfully playing the role of Mr. Dependable.